I’ll never forget the very first time I placed an order of food from a food storage company. It was with Walton Feed and, although their products are very good quality, their order form made me dizzy. A friend helped me through the order process and for many years afterward, I figured that the big #10 cans were the way to go. The bigger, the better, right? My pantry is currently stocked with mostly #10 cans. If my family’s survival depends on this food, I’ll be glad I went for the biggest containers possible. Now, 7 years later, I’m rethinking that strategy. It all started when a perfectly good #10 can of freeze-dried grapes became virtually inedible due to a small level of humidity one Phoenix summer. The grapes became sticky, a little gooey, and clumped together. It was hard to eat them and I ended up throwing most of them away. That can of grapes was a #10 can, and my young kids just couldn’t eat that many freeze-dried grapes and weren’t all that crazy about them to begin with. Food storage companies sell most of their freeze dried and dehydrated foods in 2 different size cans. Cans labeled #10 are the really big cans you might see at Costco or Sams Club, holding foods like nacho cheese sauce. They hold about a gallon of food each and in many, many homes are the building blocks, so to speak, of a family’s food storage. The smaller #2.5 can holds about 1/4 that amount. Recently I reviewed the sites of a couple of food storage companies and developed a sort of checklist I’ve followed to determine which size of can is the best choice for my family. Three of the biggest companies, Thrive Life, Augason Farms, and Emergency Essentials all carry similar products. Here are my recommendations for what you should buy in a #2.5 size can or a #10 can. NOTE: Virtually all baking ingredients should be purchased in smaller amounts, except for sugar and flour — if you normally use those 2 ingredients frequently. Baking powder. Your can of grocery store baking powder has lasted for how many months? Don’t bother buying this in a #10 can. Baking soda. If you use baking soda just for baking, this size is fine. If you use it in household cleaners or in other ways, I recommend either a #10 can size or the much bigger 5 or 13.5 pounds bags available at Costco, Sam’s Club, or on Amazon. That’s what I’ve purchased, along with a handful of #2.5 cans to use for baking. Beef and chicken bouillon. Humidity can affect this in a big way and unless you’re making meals in a jar that call for bouillon, for most households, the smaller can size is best. Cheese blend. This is a powder, similar to what you would find in a package of store-bought macaroni and cheese. Not everyone likes it, but it’s a handy ingredient for making cheesey things. A smaller can will last for quite a while. Hot chocolate mixes. Most people just don’t go through this very quickly. A small can will do very nicely. Freeze-dried cheese, if you’re stocking up for just 2 or 3 people. Freeze-dried parmesan cheese. How long has that green can of Parmesan cheese lasted in your house? Probably a very long time! Therefore, if you buy this version, plan on buying the smaller can. Freeze-dried meat and chicken, if you will be preparing meals for just 1-2 people. Juice mixes. I’m not a big fan of these and my family never drinks juice, but if yours does, look for varieties that offer a nice dose of Vitamin C, in particular. TVP (Textured Vegetable Protein) – If you choose to stock up on this, a little goes a long way. I use 1/3 cup, for example, in soups. Yeast or Instant Dry Yeast. This tends to not store very well, long-term. You’re better off with smaller packages. If you very rarely need yeast, you might just want to buy an occasional jar of it at the grocery store so less is wasted if the yeast becomes too old to be effective. Always proof yeast that is more than a few months old. Yogurt bites. These are very sensitive to humidity. Get the smaller cans and enjoy them while they’re crunchy. They are a great addition to homemade trail mixes. Most fruits, especially if you live in a humid climate. Humidity causes the sugar in fruit to become sticky and the pieces clump together. Vegetables that you don’t use very often or that only a few family members like. Vegetables that are cut into very small pieces — a little will go a long way. Examples: celery, onions, peas, chopped carrots. Even a #2.5 can of dehydrated onions will last practically forever. 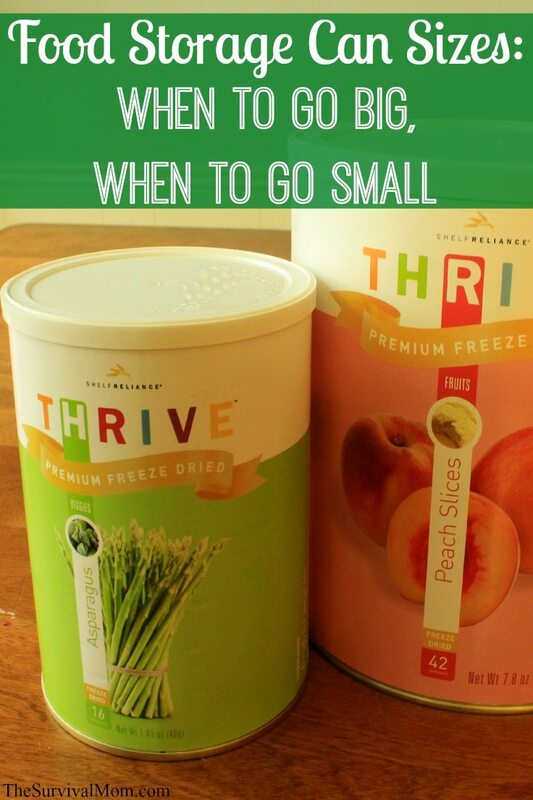 Vegetables and fruit that you really love but are very expensive in their freeze-dried or dehydrated versions. Examples: cherries, raspberries, mangoes. NOTE: Definitely consider buying varieties of freeze-dried and dehydrated vegetables and fruit that you cannot grow yourself, for whatever reason, and/or tend to be pricey. Blackberries, raspberries, cherries are all some of my favorites, but I’ve chosen to stock up on their freeze dried versions because they usually are more expensive in the grocery stores. I’ve purchased fewer freeze dried blueberries because I live in Texas blueberry country and can easily buy them in large quantities and can them for later. Bakery mixes. Some companies offer cookie, cornbread, bread, biscuit, muffin and brownie mixes. Before ordering these, take a look to see how much is required for one batch of a recipe. One sugar cookie mix recipe calls for 3 1/2 cups of the mix! Just 4 or 5 batches, and that can is ready to recycle. You’re better off stocking up on the individual ingredients to make your favorite desserts, but some people really like the convenient mixes. Beans. Beans have a very long shelf life, even when the can is opened. Fruit varieties that you know you’ll use frequently. Apple slices, for example, if your family loves apples and you use them in lots of recipes. Freeze-dried cheese. Most recipes will call for at least 2-3 cups of rehydrated cheese (think enchiladas or a lasagna). If these are recipes you want to continue making, the larger cans will be best. Grains. Virtually all grains, from wheat to pasta to oats and rice, are fine in the larger cans. If you use grains at all, they are probably a staple of your family’s diet and you’ll have no problem using up the contents in a #10 can as these foods store very well, long term. Just-add-hot-water meals. You’ll most likely use a few cups of these meal mixes at a time. Most freeze-dried meat and chicken. Some brands say that opened cans of their freeze-dried meats are only good for 30 days or so, while other companies estimate a few months. Honeyville says to use their freeze-dried meat within 30 days once opened and within a week if it’s not refrigerated. Thrive Life’s meat and chicken have longer shelf lives once open. If you have Honeyville meats, then smaller can sizes might be a better choice, unless you normally feed a large family and can easily use up a #10 can within 30 days. Some vegetables. For the most frequently used veggies, you might want to opt for the larger can size. Do you cook a lot of meat and potatoes? Then #10 cans of potatoes in all their varieties is probably your best choice. One caveat is for those living in a very humid climate. In that case you may want to buy the smaller 2.5 size cans because humidity will affect freeze dried and dehydrated vegetables. Is Food Storage new to you? Check out my list of food storage articles for newbies here! As always, always, your mileage may vary! One of my prepper pet peeves is the occasional complaint by some of my readers who don’t stop to think for themselves when they read different types of survival advice: “You say to stock up on peanut butter, but we’re allergic to peanut butter.” “Why should I buy mangoes when we hate mangoes?” All food storage absolutely must be customized to your household’s preferences, allergies, food sensitivities, storage space available, finances, and even the level of motivation. What will my family actually eat? What ingredients do I normally use in the course of a month? Are there any allergies or food sensitivities that I need to keep in mind? What is my monthly budget for extra food storage? Where will I store all this extra stuff? Never store food in an attic, garage, outbuilding, or any place that isn’t, at the very least, well insulated. Ideally, food should be stored in the 70-75 degree range. What are my priorities when it comes to food storage? Just the basics, beans, wheat, rice, and salt? Making sure my loved ones continue to enjoy the same familiar and comforting recipes no matter what happens? Sooner or later you’ll be faced with the dilemma of what to do with the contents of an opened #10 can when you know, full well, that you aren’t going to polish it off any time soon. The food doesn’t have to go to waste, and shouldn’t. You can easily repackage it. Most of the foods I’ve listed here can easily be repackaged in canning jars of the size you prefer. You’ll need a selection of jars, canning lids, a vacuum sealer, and a jar sealer attachment. This is a very, very simple process, and I’ve used it to package in jars everything from salt to biscuit mix to quinoa. You can also use the vacuum sealer and vacuum sealer bags. That’s a nice option because the individual bags can be stored in larger bins and buckets. In this video, I demonstrate how to use a vacuum sealer and jar sealer attachment to store small amounts of food in canning jars. Awesome post! I wish we had all the food storage options here in Canada. The price for the cans is waaaay out of my price range after you consider shipping. Could make a road trip and buy a large amount in one big trip and come back. If 4-5 hours each way not a terrible day drive. More than that having a 2nd driver be handy so can vet home promptly and not have to spring for a hotel. If car not big enough for what you want ask a neighbor if can borrow their larger car or pickup for a day. Items like diced ham and sausage crumbles are also better in the smaller can if you don’t have a lot of people. The shelf life is much shorter than other items after opening. Great info! I had just been wondering if the small cans would be better for certain items! Excellent article. It answered so many questions I had about the best size can to order. I plan to order a variety of #2.5 cans of meats, vegetables and fruits as well as butter powder, tomato powder and cheese. I need to gain experience cooking with these ingredients before I actually need to.